In spite of summer ending very soon, I thought I would update you on how my yearlong goal of "trying new things" has been going so far this summer. While I didn't adventure off to Alaska or sky dive or consume an olive (that will never happen), I did check a few things off my bucket list that I think are worth sharing! I would have never imagined myself flying 400 feet in the air above Lake Michigan, but sure enough I gave it a try and guess what? I loved it. Big heights are one of my greatest fears so when I made the quick decision to give parasailing a try when I was out of town, I didn't really understand what it would be like until the person before us went on the boat. Luckily, I forced enlisted my brother to go on a tandem parasail with me and we ended up having a blast. We even paid $15 extra to bring a GoPro up with us, so we got lots of fun pictures and videos from the air which was pretty cool as well. This has really been the year of travel for me, as I visited 3 new states, something I don't do often. New York has been one of the most incredible memories of the entire summer and I am so fortunate to have gone and finally met all the lovely people I've collaborated with online. I even learned that I definitely want to live in the city for at least one year of my life, and that I am definitely going to attend the SGG Conference again next July! Despite our miserable macaron failure, testing out a new recipes in the kitchen with friends is another thing I really enjoyed this summer. Even though the filling tasted like Elmer's glue, Frannie and I learned how to not make macarons (although now we have a few ideas regarding how to perfect the recipe). Practicing new recipes is something I have come to love, and it has gotten me excited for what things I'm going to make in the fall (read: apple everything). This was the first summer that I had a job and I must say, it was one of the most rewarding things I've ever done. Not only did I make some money to put into my savings for college, but I also learned so, so much. I gained experience in the retail world, became a monogram machine pro and learned how to better communicate with customers and adults, among so many other things. It got me really excited to work again next summer and it gives me an idea of what the future could hold in the professional working world! Even though I've gone to my local farmer's market in the summer for a few years now, I had always bought baked goods like the popular churros or a blueberry muffin. This summer, however, I tried buying more fresh fruits and veggies like deliciously ripe raspberries and green beans. I realized how much I like buying fresh produce and supporting local farmers, so it was really fun to do. Have you tried any new things that turned out to be great experiences? Or maybe didn't turn out so amazing? Comment below! I'd love to hear. aw this post is so cute! love all the breakdowns, and it sounds like you had an amazing summer!! I love trying new things and pushing myself out of comfort zone even though it can be hard some times! I've been trying to do the same thing this summer! 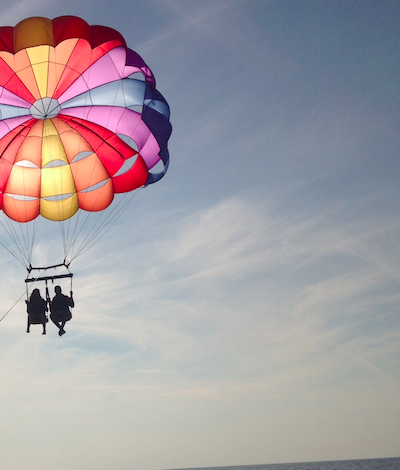 I've always wanted to go parasailing, so I just might have to try it per your recommendation! I actually went flying trapezing for my birthday! You can read about it more on my blog, but it was so fun! It's scary jumping off a platform and it actually was an awesome ab workout! Parasailing sounds awesome too!